Prostate cancer is a common cause of cancer death in men that is potentially curable when it has not metastasized. High-risk disease (clinical stage T2c, Gleason score >8, and prostate-specific antigen (PSA) >20 ng/ml), is more often associated with metastases especially to lymph nodes and bones. 99mTc-MDP bone scan is the most commonly used modality to assess for skeletal metastases in prostate cancer. However, if magnetic resonance imaging (MRI) is done, usually for defining the local extent of disease, it is more sensitive and specific for bone metastases than bone scan. Gallium-68 prostate-specific membrane antigen (68Ga-PSMA) is a new positron emission tomography-computed tomography (PET-CT) tracer that has shown high sensitivity and specificity for local disease, lymph node metastases, and bone metastases. We present a case of high-risk prostate cancer with false positive skeletal metastases on MRI as confirmed by histology which was truly negative on bone scan and 68Ga-PSMA PET-CT.
A 53-year-old man was referred from a peripheral hospital with high-risk prostate cancer, clinical stage T2c, Gleason 4 + 5, and PSA of 103 ng/ml. He had a 99mTc-MDP bone scan which was negative for skeletal metastases [Figure 1]. He was considered for radical surgery and was, therefore, sent for pelvic MRI to define the local extent of disease and 68Ga-PSMA PET-CT to assess for distant metastases given the high PSA level. The MRI and 68Ga-PSMA PET-CT were acquired about 1 week apart. MRI showed inhomogeneous marrow signal with numerous low signal lesions on T1- and T2-weighted images in the pelvic bones consistent with skeletal metastases [Figure 2]. 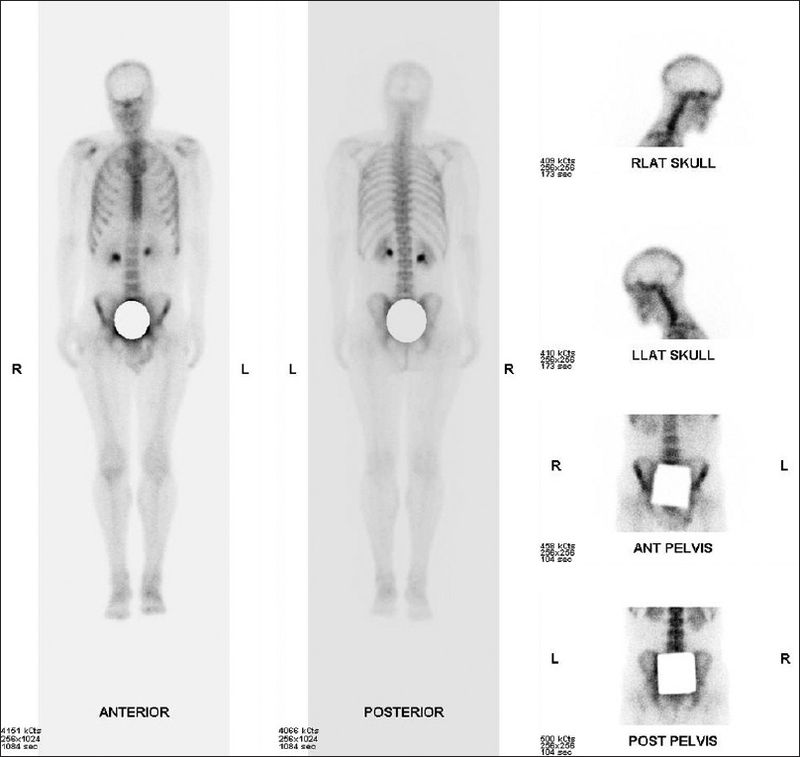 There were no skeletal metastases on 68Ga-PSMA PET-CT in the pelvis or any other bone [Figure 3]. Bone marrow biopsy was done because of the discordant finding on the MRI and 68Ga-PSMA PET-CT. Histology showed normal bone marrow with no evidence of malignancy [Figure 4]. Prostate cancer is the most common malignancy after middle age and the third-most common cause of cancer death in men., Clinical risk stratification is based on findings on digital rectal examination, Gleason grade, and PSA level. The disease extent, localized or metastatic, is assessed with imaging. Metastatic disease is more common in high-risk patients. Prostatectomy in addition to other forms of treatment may be offered to patients with localized disease whereas patients with metastases are not offered prostatectomy., Bone is the second-most common site of prostate cancer metastases after lymph nodes, and 99mTc-MDP bone scintigraphy which is most commonly used for assessing skeletal metastases has a lower sensitivity and specificity compared to whole-body MRI (79% vs. 97% and 82% vs. 95%). Whole body MRI is however often impracticable. In prostate cancer, MRI is used to define the local extent of disease and assess invasion into surrounding structures. 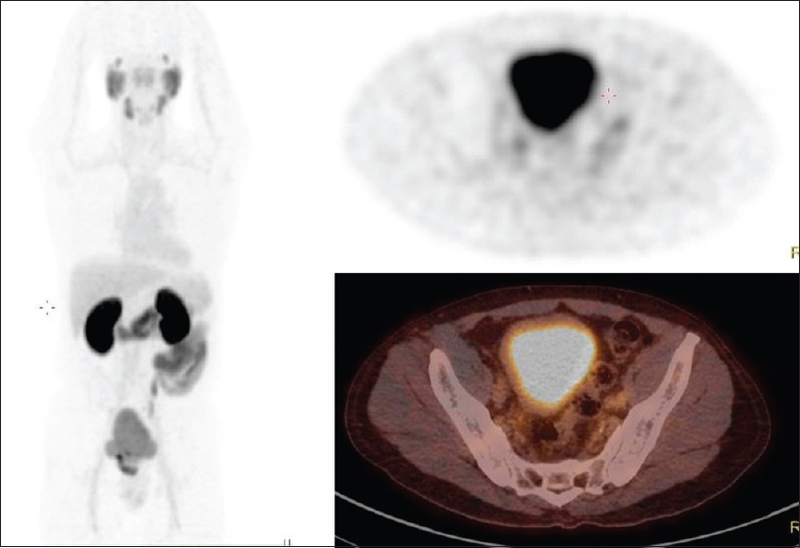 68 Ga-PSMA PET-CT is an emerging modality that enables imaging of PSMA which is overexpressed in the primary lesion and metastases., The expression of PSMA at the primary site and in metastatic lesions is directly related to the aggressiveness of the prostate cancer. 68Ga-PSMA PET-CT is highly sensitive for nodal and skeletal metastases. The role of 68Ga-PSMA PET-CT in prostate cancer is still evolving. Currently, it is recommended for localization of tumor following biochemical recurrent prostate cancer and in the staging of high-risk prostate cancer. Our patient had pelvic MRI to appropriately plan for prostatectomy and had 68Ga-PSMA PET-CT so as to be absolutely sure there was no metastases particularly to pelvic and intra-abdominal nodes. Had a 68Ga-PSMA PET-CT not been done, the finding of pelvic bone metastases on MRI would have superseded the negative bone scan and the patient would not have been considered for radical treatment. The florid nature of the pelvic metastases seen on MRI was however not in keeping with a negative 68Ga-PSMA PET-CT. We considered that the patient may have a second malignancy responsible for the bone marrow infiltration which is not 68Ga-PSMA avid. Pelvic bone biopsy showed normal marrow with no evidence of malignancy. MRI is more sensitive and specific than 99mTc-MDP bone scan for skeletal metastases and patients who have just these two investigations and show skeletal metastases on MRI would be classified as having skeletal metastases irrespective of the bone scan findings. If 68Ga-PSMA PET-CT is done and negative for skeletal metastases in the setting of a positive MRI, a histologic diagnosis may be needed to avoid wrong staging of the patient which will affect the type of treatment offered. This report contributes to the data on the value of 68Ga-PSMA PET-CT in prostate cancer skeletal metastasis. We would like to acknowledge Dr. Otto, MJ, Department of anatomical pathology for providing the histology slides. Shen G, Deng H, Hu S, Jia Z. Comparison of choline-PET/CT, MRI, SPECT, and bone scintigraphy in the diagnosis of bone metastases in patients with prostate cancer: A meta-analysis. Skeletal Radiol 2014;43:1503-13. Humphrey P, Schuz J. Cancers of the Male Reproductive Organs: World Cancer Report. Lyon: World Health Organization; 2014. p. 453-64. Damber JE, Aus G. Prostate cancer. Lancet 2008;371:1710-21. Sweat SD, Pacelli A, Murphy GP, Bostwick DG. Prostate-specific membrane antigen expression is greatest in prostate adenocarcinoma and lymph node metastases. Urology 1998;52:637-40. Hofman MS, Iravani A. Gallium-68 prostate-specific membrane antigen PET imaging. PET Clin 2017;12:219-34. Kratochwil C, Afshar-Oromieh A, Kopka K, Haberkorn U, Giesel FL. Current status of prostate-specific membrane antigen targeting in nuclear medicine: Clinical translation of chelator containing prostate-specific membrane antigen ligands into diagnostics and therapy for prostate cancer. Semin Nucl Med 2016;46:405-18. Fendler WP, Eiber M, Beheshti M, Bomanji J, Ceci F, Cho S, et al. 68Ga-PSMA PET/CT: Joint EANM and SNMMI procedure guideline for prostate cancer imaging: Version 1.0. Eur J Nucl Med Mol Imaging 2017;44:1014-24. Lecouvet FE, Geukens D, Stainier A, Jamar F, Jamart J, d'Othée BJ, et al. Magnetic resonance imaging of the axial skeleton for detecting bone metastases in patients with high-risk prostate cancer: Diagnostic and cost-effectiveness and comparison with current detection strategies. J Clin Oncol 2007;25:3281-7.